What does ‘meaningful business’ mean for Go-Ahead Group’s CIO? 'Meaningful business' is a concept that has gained significant traction across the industry, but how do the most influential leaders define it? 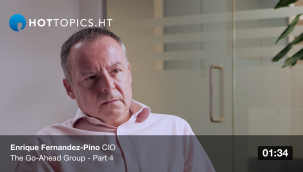 For Enrique Fernandez-Pino, Group CIO, Go-Ahead Group, meaningful business comes from a commitment to reducing carbon footprint, and taking ownership for the wellbeing of both staff and the society in which a company operates. As the pace of the digital economy quickens, the CIO is becoming more integral to the business, becoming across-the-board business leaders. It is undeniably an exciting time for the CIO, and the long-standing stereotype that encapsulates the CIO as purely an 'I.T professional' is on the way out. Once upon a time, digital transformation was the term at every board table: now businesses want to innovate constantly. What does that look like?